The first recipients of the fun utility vehicles, which are still in beta testing, will be fleets, specifically HulaCar, a San Diego carsharing operation. The world’s first battery-electric fun utility vehicle (FUV), designed and manufactured by Oregon-based Arcimoto, made its debut in Carlsbad, Calif., Friday, with the company’s investors and stockholders, and electric vehicle enthusiasts clamoring to test drive the car. The three-wheeled two-seater can go from 0 to 60 mph in 7.5 seconds, and has a top speed of 80 mph. With a charge range of 130 miles, the street-legal vehicle is being marketed as the optimal way to get around town and run errands without having to use your normal vehicle. 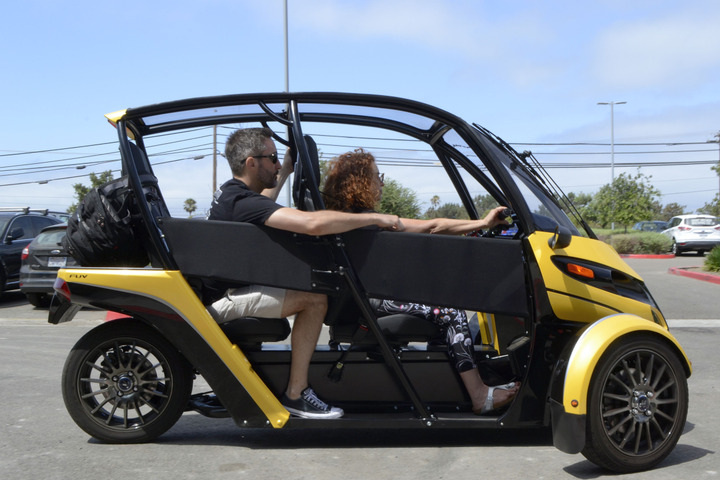 Arcimoto officials said the compact vehicles will help cut down on greenhouse gas emissions, reduce traffic congestion, and free up parking spaces in cities where parking can be difficult to find. The first recipients of the vehicles, which are still in beta testing, will be fleets, specifically HulaCar, a San Diego carsharing operation. The mobility provider has ordered 100 vehicles in total for its program, which also serves Los Angeles, Santa Barbara, and Orange counties. Arcimoto’s partnership with HulaCar will see the zero-emissions vehicles placed around popular downtown locations, such as hotels, mobility hubs, and train stations, helping tourists navigate cities and solving the first-mile, last-mile problem for residents. Founded in 2007 by Mark Frohnmayer, Arcimoto has been working on the FUV for the past 10 years. He said he developed the idea for the FUV after being unable to find a compact vehicle that he could run errands in around Eugene, Ore.
Frohnmayer said he was “shocked” when he couldn’t find anything on the market that met his criteria. So, he took the money he made from selling his software development company, GarageGames.com, and launched Arcimoto. 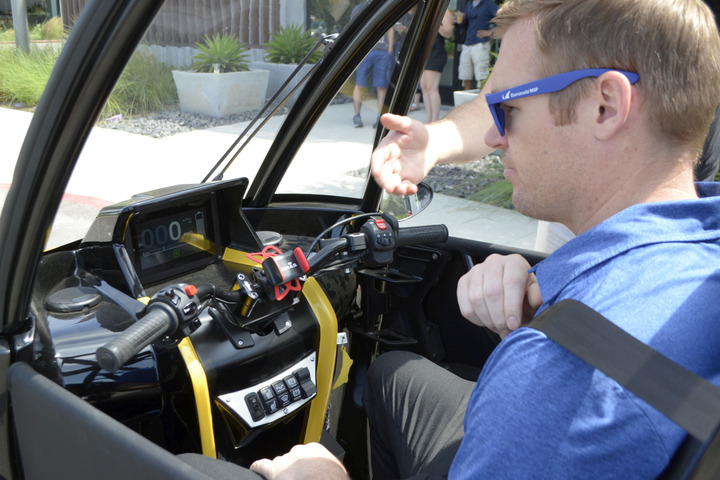 It wasn’t until the seventh generation that Arcimoto’s engineers decided to swap out the traditional steering wheel for handlebars, a move which Marketing Associate Olivia Clingman-White said drastically reduced the vehicle’s weight and shortened its length. “The lightbulb moment for me was seeing a three-wheeled kit vehicle… and in the moment, it illuminated this giant gap between the bicycle and the car,” he continued. While the FUV does not at first glance seem to resemble a bicycle, riders can see the influence once they buckle into the driver seat. The FUV model that is set to hit the streets of San Diego soon is the eighth generation of the vehicle. However, it wasn’t until the seventh generation that Arcimoto’s engineers decided to swap out the traditional steering wheel for handlebars, a move which Marketing Associate Olivia Clingman-White said drastically reduced the vehicle’s weight and shortened its length. Manufactured with heated seats and Bluetooth-enabled speakers, the FUV can be registered in California and Oregon as a motorcycle. Registration procedures for other states vary, Arcimoto Communications team member Jonathan Miller said. With HulaCar set to receive 100 vehicles, Arcimoto plans to work out any kinks that come up before it starts shipping the vehicles to individual consumers by the end of the year. Frohnmayer hopes that people who use the vehicle’s as part of HulaCar’s carsharing will fall in love with the vehicles enough to purchase one of their own.